A developmental preschool, where toddler and infant care are also offered. This facility sports a private large, grass field, outdoor play gym and swing set. Our mission to make our community a better place through high quality, inclusive education. Our Outpatient Therapy Clinics provide a traditional clinic environment, complete with all of the latest equipment to support our professional therapists, including a sensory and swing room. Our clinic also provides classroom environments that are structured like a school to provide programming for younger individuals, or those needing a more structured environment. We have clinics in the East and West valley. A therapy house that provides a functionally appropriate environment for teaching life skills and houses our Junior and Senior Life Skills Academies. This natural environment setting in a residential community affords a variety of resources for our instructors that a typical clinic does not offer. Strengthening families and communities by helping people be their best selves through dignity and acceptance. Through our values, we are committed to helping you be your best. S.E.E.K. 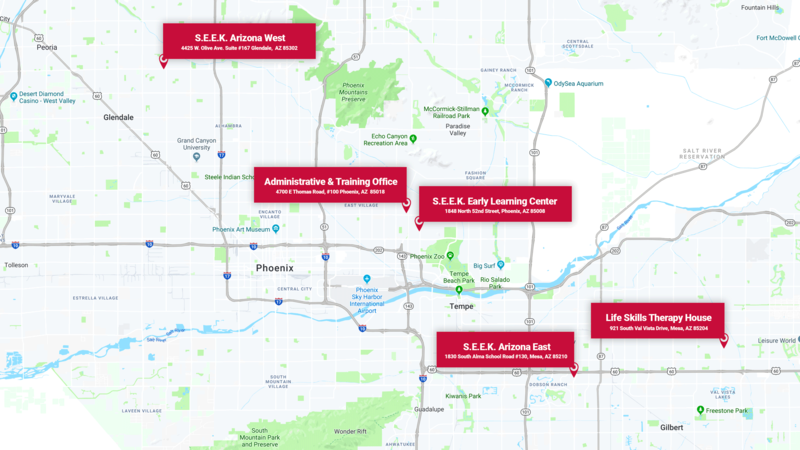 Arizona provides programs and services in three innovative environments, in addition to a child or adult’s home.